There may be situations in which it would be helpful to be able to run household items, such as a radio, emergency flood-light, computer, or cell-phone charger off a car battery. During a power outage, for example, it may be a matter of safety to be able to hear weather reports, access the internet, or keep your cell phone charged up. A good choice for an inverter will have both clamp connectors and a plug-in connector that attaches to a car accessory socket. People attuned to survivalist skills or emergency preparedness know that with a simple device known as a power inverter, the 12-volt electrical current produced by an ordinary car battery can be converted into 120-volt current that can power many types of ordinary plug-in devices. An inverter can be used on the battery that is already mounted in your car, but many people opt to store a couple of spare car batteries around the home, keeping them charged up for just such needs. The issue is not just that your car battery has no slotted outlets in which to plug your radio or flood-light. Car batteries operate on direct current flowing at 12 volts. Your household appliances, on the other hand, operate at 110-120 volts of alternating current—meaning that the current flows in alternating pulses at 60 MHz, not a steady direct flow of electricity as occurs in a DC battery. So before any household appliance can be used with a car battery, you will need a device that now only provides the slotted outlets in which to insert the plugs on your devices, but also converts the electricity into an alternating current at the correct voltage. This is where the power inverter comes into play. 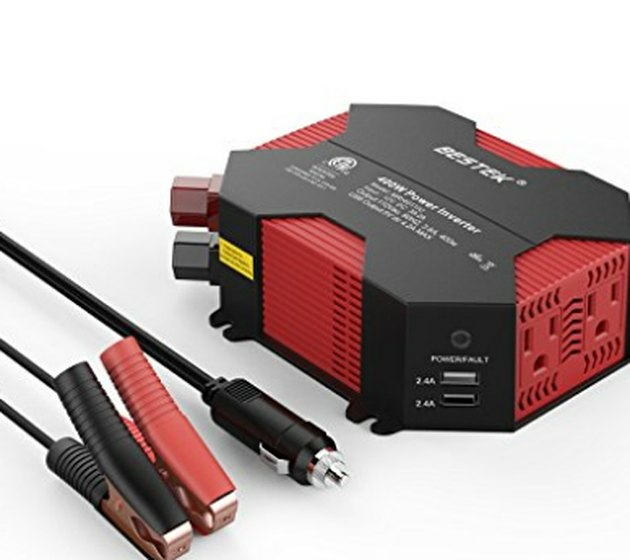 Available at auto supply dealers, hardware stores, and online retailers, a power inverter is a nifty device that has cables or wires that clamp onto the terminals of your car battery. Incorporated into the inverter is one or more slotted outlets that accept plugs from household devices. When attached to a charged battery, it allows you to power 110/120 volt devices for a limited length of time. Many inverters are now sold with both battery clamps as well as a socket plug that can be inserted directly into the power accessory outlet (the cigarette lighter) on your car, for use in instances where you're using the battery already installed in your car. Make sure to buy an inverter designed for a 12-volt battery. Most will be labeled with words like "12-volt to 110-volt converter." An inverter designed for other voltages will not work on a car battery. Look for one with both cable clamps AND a plug-in connector. This will allow you to use the inverter both on stand-alone batteries as well as on a battery already installed in your car. Consider the wattage. All household appliances have different wattage ratings, and you need to make sure your inverter is up to the task of powering the devices you want to use. A floodlight, radio, or phone charger is a relatively low power consumer, and a 150- or 300-watt inverter will probably work just fine. But devices that have motors, or devices that heat or cool—such as a space heater or electric food cooler—draw considerably more wattage, and won't work at all unless you have an inverter rated for 500, 750, or even 1,000 watts. Be aware, though, that the greater the wattage, the faster you will drain down your battery. With the inverter switch in the OFF position, connect the negative clamp (usually colored black) to the negative post on the battery. Then connect the positive clamp (usually colored red) onto the positive post on the battery. With the household device shut OFF, plug its power cord into the slotted outlet on the inverter. Turn the switch on the inverter to the ON position. Then turn on the household device you want to run. If it fails to operate, it means either the battery is not sufficiently charged to provide the necessary power or that the clamp connectors are not firmly connected. Usually, though, your device will begin to operate. When finished using the device, reverse the process: turn off the household device, turn off the inverter, then unplug the appliance, and finally unclamp the cables from the battery, beginning with the positive power pole.